Consider this my revenge. Paul caused me a lot of heartache and grief back in June last year. It was all going so well, until he decided to turn his back on my favourite team (after South Africa of course) and predict a win for Spain. The cheek! Many a blue-eyed German boy was in tears after the match and for me the World Cup was over. I mean come on, I pour my heart and my soul into the competition only to have it bludgeoned like this? Pfffft. The death of poor Paul a mere four months later, did manage to somewhat appease me, but it wasn't enough. No, his entire species should pay for his crimes! Or, at least just a few more... Clearly our local grocery store share my sentiments (they must have German blood, I'm sure), as I was confronted by a big pile of slippery octopuses (octopi?) when I popped in there on Sunday. And given my vengeful thoughts I couldn't *not* buy a few of 'em in an attempt to even the playing field, now could I? No matter that the thought of actually prepping the octopuses terrified me beyond belief. Thank goodness for the smiling fishmonger who offered to clean them for me - obviously another German supporter. And so I gathered up some feta, greenpepper and a chilli or two and proceeded to exact my revenge on the cephalopoda class. And as much as I'm loathe to admit it, I ended up loving that octopus. Perhaps it was the sweet, roasted baby onions or the sweet yellow tomatoes that replaced the octopus hatred with octopus love. Or perhaps it was just the knowledge that I had finally won in the Battle of the Octopus. Serve this straight from the oven with lemon wedges and boiled potatoes, tossed in a little bit of oil. 1. Arrange onions in the base of an oven casserole dish, drizzle with onion and roast at 180C (350F) until soft. 2. Meanwhile, prepare the octopus by separating the tentacles from the large tubes. Reserve the tentacles for another use (I like to simply fry them with a bit of olive oil, lemon juice and salt), then proceed to halve the tubes. Using toothpicks, secure the bottom of the tubes to form a pouch in which to place the filling. 3. Combine greenpepper, sundried tomatoes, feta, chilli and peppadew (if using) in a small bowl, then spoon into the prepared octopus pouches. There will be some filling leftover, set this aside while you secure the top of the pouches with more toothpicks to form neat little parcels. 4. 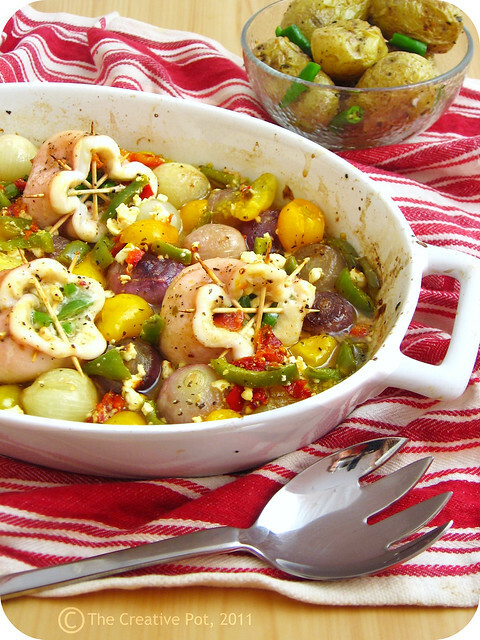 Arrange the stuffed octopus amongst the baby onions in the casserole dish, then add the baby tomatoes and the remainder of the filling, distributing it evenly around the octopus parcels. Drizzle with lemon juice and reserved oil from the sundried tomatoes (alternatively just use olive oil), then season with salt and freshly ground black pepper. 5. Bake in the oven (again at 180C - 350F) for 25 - 30 minutes or until the octopus is tender. 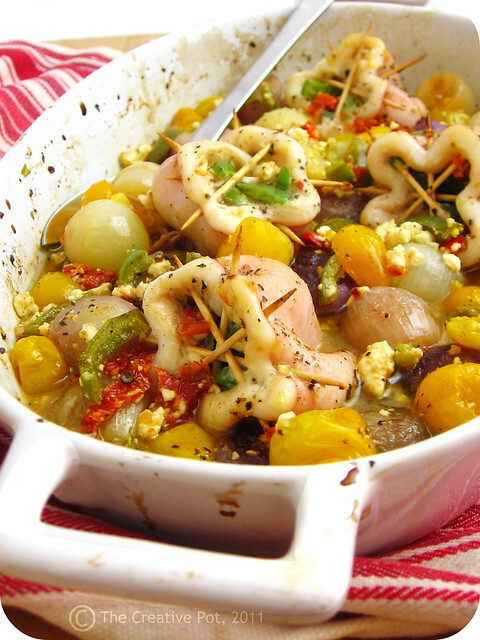 Most octopus recipes will advise you to boil the octopus first to ensure its tenderness. I neglected this step and mine turned out perfectly tender, although there is some evidence that suggests freezing the octopus overnight (as I did) accomplishes the same thing. Feel free to use your judgement though as my knowledge of octopus preparation is very limited. I have never tried octopus before but your recipe looks and sounds like it would be the one to start with. Your photos are incredible. What a dish! Oh wow that looks truly delicious! Will be sure to give it a try. The photos and colors let alone descriptions have left me hungry at this tender hour. 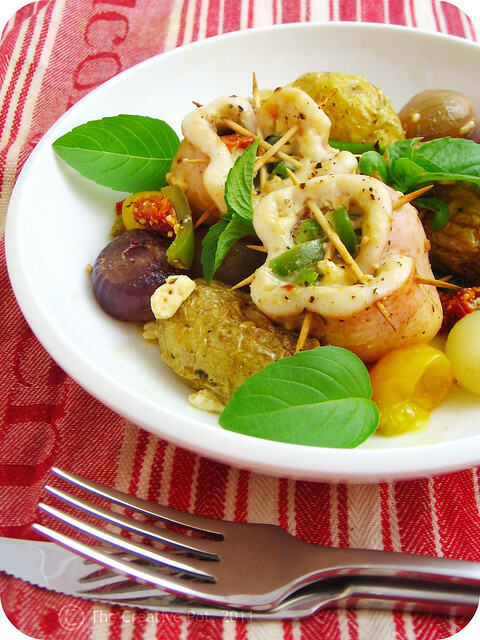 Thank you for making octopus an inviting seafood option. Well I'm not EXACTLY sure what octopi have to do with soccer (or football as you guys call it) but I do know I've never seen those little cephalopods look this good! This looks delicious... I have a dilemma, since I love octopi (the living creatures).. they are so fascinating and intelligent... BUT I also love to eat them. ..sigh... But yes, I will certainly be trying this recipe soon! Thanks for sharing! Man this looks good, I can so do this dish! Well done for attempting this dish, I still have some Paul in my freezer, maybe I must give this a go!! This dish looks stunning! Nice photos. I love all types of seafood, definitely more than I care for football, and surely will try this. Greek fish markets I use to often visit, in order to make it tender, prepare the octopus beating it into the ground. I believe the method works only for fresh catch and for the whole octopus and it is not a pleasant thing to see...But it really works! What a fantastically creative idea - it's no wonder where you get your blog name from! You're The Creative Pot indeed! This look super yummy - I can't wait to try it. Those little onions look so good, just want to pop one off the screen into my mouth! Hey, hey...poor Paul and his sea-faring cronies. But boy do they taste good! This is just stunning! Amazing looking dish. Hah, and to think a German zoo actually wanted to buy the octopus!